Salvation And Survival: Saturday Morning Commentary: Is Anybody Paying Attention? Saturday Morning Commentary: Is Anybody Paying Attention? As I contemplated today's post, I hesitated about bringing it to you. My desire is always to enlighten and to encourage. But I'm afraid that what I have to say today is frightening. Yet it must be brought to light. And considering my rant yesterday, I just want to ask all the socialists who consider themselves Sooo compassionate ..... why aren't you speaking out about the death and the violence at our southern border? 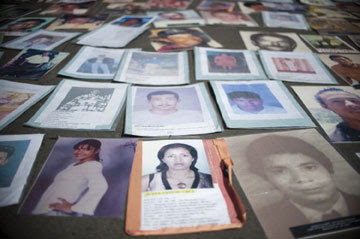 How can you, or for that matter, anyone ignore the 49 mutilated, decapitated bodies that were recently dumped on a highway connecting the northern Mexican town of Monterrey to the U.S. border? Where is the media? Where is the Administration? And this isn't the first occurrence. Since 2006, nearly 50,000 people have been killed south of our border. We are all aware that the drug cartels are upping the ante in their attempt to control and grow drug traffic between Mexico and the U.S. It is a billion-dollar business and innocent lives are an expendable commodity. But what alarms me is that it's not just the drug cartels we are dealing with here. Earlier this year, at a House Foreign Affair's Committee hearing, former Chief of Operations of the DEA, Michael Braun, reported that the Iranian-supported terrorist group Hezbollah has spread its influence all the way to the U.S. border with Mexico. Braun said Hezbollah and other terrorist groups understand that the Mexican cartels are already operating successfully inside the United States. And they wish to exploit that vulnerability. “If anyone thinks for one moment that these terrorist organizations do not understand that the Mexican drug trafficking cartels now dominate drug trafficking in our country – reportedly in more than 250 cities – than they are very stupid or very naive,” he said. Remember the plot, recently uncovered by the DEA, involving an Iranian operative who was planning to allegedly assassinate the Saudi ambassador during a trip to Washington, D.C? There was no need to try to avoid detection coming into U.S. airports. Our porous southern border makes it easy for these operatives to sneak into the country. Indeed, government investigators uncovered the connection between Iran’s Islamic Revolutionary Guard Corps-Quds Force and the Zeta drug cartel in the foiled assassination attempt on U.S. soil. Braun said Quds Force and Hezbollah work “very, very hard” to develop relationships with criminal groups that already have in place systems for illegal activities, including drug and human trafficking, money laundering and forged document operations. “And by developing those relations it provides them with the ability to operate far from home in our neighborhood and – as I said earlier – on our doorstep,” he asserted. So does any of this concern anyone else besides me? Why is this not being reported from every news outlet in the nation? Should we really be more concerned about Roger Clemens' steroid use? Is this what our Congress finds more important than U.S. Security? After all, national security is the ONE area the Government is SUPPOSED to undertake on our behalf! Is anyone else just a little bit troubled that an increasing number of the nearly 50,000 Mexican dead have been decapitated? And their hands have been cut off? I don't want to sound morbid, but this is barbaric and extremely upsetting. The combination of ruthless drug cartels and radical terrorists is not a good thing, no matter where it occurs. But when it is just across our southern border, and we are not receiving any information from our government officials --- no warnings; and no apparent plan to stop it or defend against it --- then I can't help but wonder, what's next? When does the violence spill over into the U.S.? In what other ways have these terrorist groups infiltrated our country? What is their agenda? How many more innocent victims have to die before this situation is addressed --- openly and transparently by the media and the Government? We can no longer ignore the facts. We ARE vulnerable, and without any semblance of a Border fence, what's to stop these terrorists (and the killings) from continuing? How long before American citizens become the next victims? The final words of Michael Braun haunt me .... "I think there’s going to be hell to pay in the not too distant future,” he said. May God protect us! Psalm 140:1 "Rescue me, LORD, from evildoers; protect me from the violent." What is alarming to me is that the enemy is becoming bolder in carrying out these heinous murders. You used to hear about an occasional body showing up, but now the deaths number in the 20's, 30's and this time, nearly 50 at a time! It is fast becoming apparent that our government, who is charged to protect us by the Constitution, is not going to be there for us. And the enemy knows it! So individual citizens, like your friend, have to protect themselves. I can't believe how fast we are deteriorating as a country! They ARE among us - have to be ! For our " leader " to state that the fence is essentially complete when - as G. Beck has pointed out - it really is only 5% complete, suggests to me the lack of seriousness in HIS carrying out the duties of Commander in Chief. I cannot believe we have allowed our citizenry to equate the performance of Washington, Jefferson etc. to this nonsense. I, too, am completely mystified as to the reasoning behind the false statements about the border fence and the seemingly indifference to the plight of people on BOTH sides of the border. I would think that decapitated bodies would be of prime interest to any head of state, but when the loss of life is possibly associated with Hezbollah, then don't you think the citizens are due at least a warning, if not a full investigation, as well as full protection of the U.S. government? love your blog-keep up the good work. thank you for speaking the truth. And thanks for your encouragement. It's because of people like you that I keep writing.